Being one of the most sought-after housing estates in city-fringe location, HDB is set to launch its first projects within the Bidadari estate in the month of November 2015. 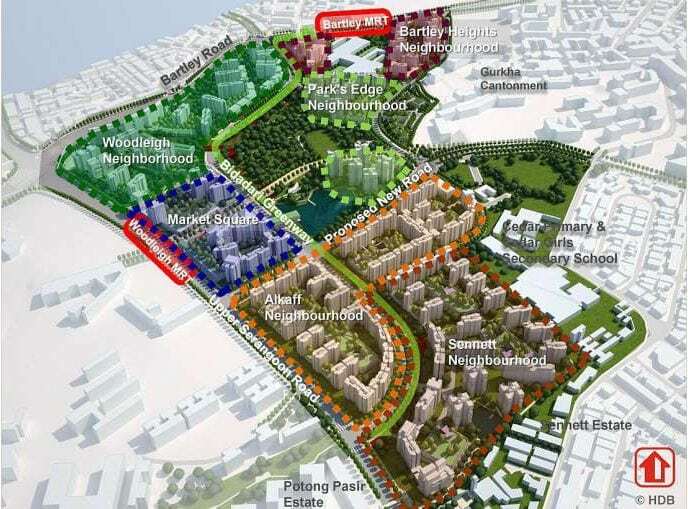 Spanning across 93-hectare of land space, which is approximately the size of 150 soccer fields, the Bidadari estate will be bounded by Upper Serangoon Road, Bartley Road, the Sennett Estate and also Mount Vernon Road. The whole precinct will be carved in 4 separate districts and the largest of them all will be the Alkaff district. The first 3 public housing projects, namely Alkaff Vista, Alkaff Lakeview and Alkaff CourtView – will have a total of 2,139 homes constructed and completed between 2019 to 2020. To fulfill the estate’s vision of having a community within a garden, these projects will set to feature plenty of lush greenery and spaces for social activities, such as garden courtyards, roof gardens, and veranda which caters activities for the community. Residents in the Bidadari new town will be able to experience an eco-lifestyle as the estate will consist of a 10-hectare Bidadari Park, which will also house the new Alkaff Lake (taking after the name of the Arab family that constructed the Alkaff Lake Gardens back in 1929, which was closed after the Second World War). On top of that, the residents will also be facilitated with a market square within the vicinity, which will house a bus interchange and food court. According to the HDB, the planning of such housing environment is to encourage residents within the estate to use lesser of motor vehicles and travel more by foot or cycle instead. To further promote such lifestyle, there will also be schemes such as bicycle and car-sharing provided. Although being once a cemetery site, many are still eyeing to own a home in the new Bidadari estate. The planning of this new town has also sparked interest from the the private property sector, especially in nearby new launch projects such as Botanique at Bartley, The Venue Residences and also most recently announced development, The Poiz Residences.